Be a lasting part of the Prairie Mills windmill restoration! Purchase a personalized brick, tree or other landscaping plants for yourself or a loved one. All bricks will be placed in a memorial park just South of the windmill and along walkways. Please complete and return the order form below. 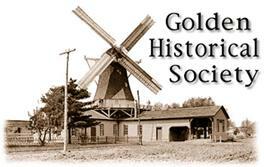 Make checks payable to the Golden Historical Society. Order only one brick per order form. - Only one letter, number or punctuation mark per space. Yes, I'd like to be a part of the windmill memorial park!